EnviroPolitics Blog: Get 2 free issues of EnviroPolitics--then add 30 more! 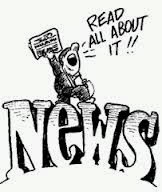 If you are not a subscriber and haven't had a chance to see a copy of our daily newsletter, EnviroPolitics, you don't know what you're missing. Until now. Check out two recent issues below and discover why the the most successful environmental law firms, consultants, trade associations, businesses, lawmakers and regulators in New Jersey, Pennsylvania, New York and Delaware find it to be an indispensable daily enjoyment. If you like what you see (and we bet you will), take us up on a terrific offer--a full month's subscription for free. That's 30 individual issues. No obligation. No automatic extension. No gimmicks. No kidding. Like what you see? Jump on your free, 30-day trial subscription! Feel free to share this with friends and associates.